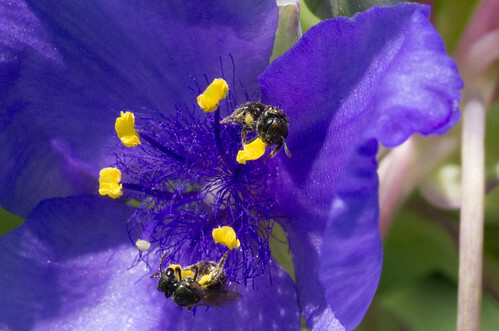 This entry was posted in Prairie Insects, Prairie Natural History, Prairie Photography, Prairie Plants and tagged prairie garden, spiderwort, syrphid fly, tradescantia occidentalis by Chris Helzer. Bookmark the permalink. I love the detail of your photographs. And judging by my experiences walking in my own prairie the past few days, you ought to include a picture of a tick questing for a host! Syrphids are out early! Toxomeres flies in particular are a lot of fun to watch, they’ll visit grasses too – to eat the pollen, I presume. Lasioglossum bees aren’t much bigger, but at least they’re fuzzy, and likely spread pollen around at least on Spiderwort. The flowers are a great subject, and draw a lot of visitors. Size may be a more important factor than hairiness. The stigma and anthers are relatively far apart. Do these flies manage to make contact with both? A larger bumble bee has a better chance to rub against both. Even more peculiar are some azaleas where these flower parts are even farther apart. To make their pollination even more complicated, they depend on buzz pollination. I have to find out more about their pollination. Aren’t Tradescantia’s the most wonderful color?